This Island peak Climbing Trek in the Everest region that gives you an opportunity to experience both trekking and peak climbing. Island Peak or (Imja Tse) in the Imja valley of Khumbu valley area is the most achievable climbing peak without having prior mountaineering experience. Located just 10 km away Mt. Everest summit, Island peak gives a 360 degree display of great Himalayas. 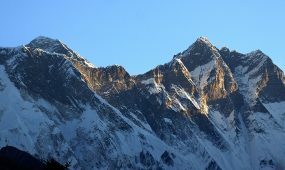 Island peak, the most climbed climbing peak of Himalaya is really an augmentation of south end of Mt. Lhotse that remains as a stupendous peak in the midst of the mammoths of the Himalaya. If you love trekking in Nepal and want to have a peak climbing experience too, then this trip is an ideal choice for you. 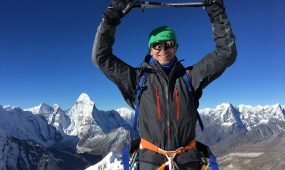 Our Island Peak Climbing with Everest Base Camp trek adventures is intended to carry out both trekking and peak climbing in Nepal for all adventure lovers. Our Island peak with Everest base camp trek program begins as we take an invigorating flight to Lukla and begin trekking the exemplary Everest base camp through the Sherpa towns of Phakding, Namche, Tengboche, Dingboche, Lobuche and Gorakshep while spending through two night in Namche and Dingboche for proper acclimatization. We trek to Everest base camp so that our body adapts for our Island peak climbing adventure. We additionally trek up to Kala Patthar for best views of Everest and its neighboring snow-capped mountains. Then, we trek back to Chhukung and advance towards the Island peak. 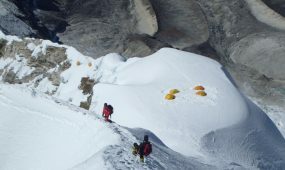 Initially, we trek to Island peak base camp, learn and get detail info with practicing use of climbing gears. We spend a night in base camp. Following day is the hardest day yet as we achieve the summit. The climb starts with a scramble up a rough crevasse to an edge where we put on crampons and rope up for the ice sheet crossing heading towards the south edge. 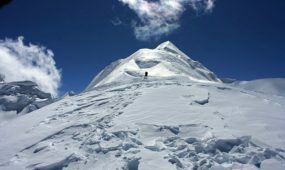 The climb is as steep as 45 degree on the way to summit ridge from where we get astounding views of Lhotse, Makalu, Baruntse and other Himalayan panoramas. Nepal Guide Info Organized this trip every month but best time to go there , March to May and September to November . Our representative will be receiving you at Tribhuvan International airport, Kathmandu and s/he will be displaying Nepal Guide Info Team signboard outside the airport terminal. You will be then transform hotel in our private tourist vehicle. Meal Included: Special welcome dinner. Accommodation: 2/3 Star Category Hotel Thamel Kathmandu . Today we will take rest at Namche Bazaar. Rest day during trek means to hike to higher elevation and trek down bank for proper acclimatization. We will walk up to the Everest view Hotel, which lies at the altitude of 3880 m. 2.5hrs of uphill hike on the stony trails of open hill brings us to Everest view Hotel. You can enjoy the views of Thamserku, Kusum, Kantega, Lhotse and Ama Dablam among others from the site. Trekking down back to Namche on the same trail is easy 1.5hrs walk. Fly back from Lukla to Kathmandu. Most of the time you have a morning flight. So you should be prepared to go to the airport on time. You should have very nice and 45 minutes scenic flight to Kathmandu. Our guide still with you to drop you to the hotel in Kathmandu. There will be a farewell dinner in the evening to celebrate the climbers’ successful summit of the Island peak at Nepali Cultural Restaurant Gokarna house paknajol thamel . Overnight in Kathmandu at 2 / 3 Star category hotel. Top quality mountaineering clothing and equipment is an investment that will see you through years 2018 of adventures. It is wise to choose carefully, and not to skimp on quality. The companies and products you see listed below can serve as starting points of reference for you. Take this list to your local outdoor specialty shop. Lightweight hiking boots: Leather or fabric/leather with sturdy mid-sole and a Vibram sole. Booties: Synthetic or down insulation. Any brand with thick foam soles. Bandana: Two to three traditional cotton style. Gaiters w/reinforced lowers: Short, simple gaiters are best, such as Outdoor Research Rocky Mountain Low Gaiters ( Nepal Planet Treks ). Ear plugs: Very useful in noisy lodges and tents. Available in most hardware stores. Water purification tablets: Such as Potable Aqua brand iodine tablets. You will be given plenty of purified water during your trek and climb, but one bottle of backup purification tablets is always a good idea for your travels. They are especially useful in hotels on you way to Nepal. You should not drink untreated tap water anywhere in Asia and bottled water in some rare cases might not be available. Travel bags: Extra duffel bags are useful for storing things in Kathmandu, in Namche and at Base Camp. Most soft sided “carry-on’ type bags work well. (Camp Trails “Packable”, Wild Things “carry-on”) You might also use extra large stuff sacks. Plan to fly to Nepal with two large duffels, and some smaller bags for organizing inside. City clothes for Kathmandu Thamel : Casual, one or two changes. Kathmandu is warm in the daytime, cool in the evenings. Camera / video camera w/ extra batteries: We suggest plenty of non-rechargeable power, such as lithium batteries. Cold weather is hard on ni-cad and regular alkaline batteries and solar recharging is not always an option. Film: Bring plenty, it is expensive in Nepal. Be sure to keep in your carry-on luggage, in clear zip- lock bags so that it can be inspected at airports. If you bring a digital camera, bring extra media storage cards. You will take lots of photos! High in the Khumbu valley , close to Everest and closer still to the precipitous south face of Lhotse, the aptly named Island Peak (6189m) rises above a tangled knot of glaciated valleys. With its outrageous location and elegant summit ridge, this peak has been a favorite with Nepal Guide Info team leaders and clients for 2 decades. Trekking via Namche Bazaar and Thagboche, we follow the Everest Base Camp trail to Lobuche beside the Khumbu glacier. 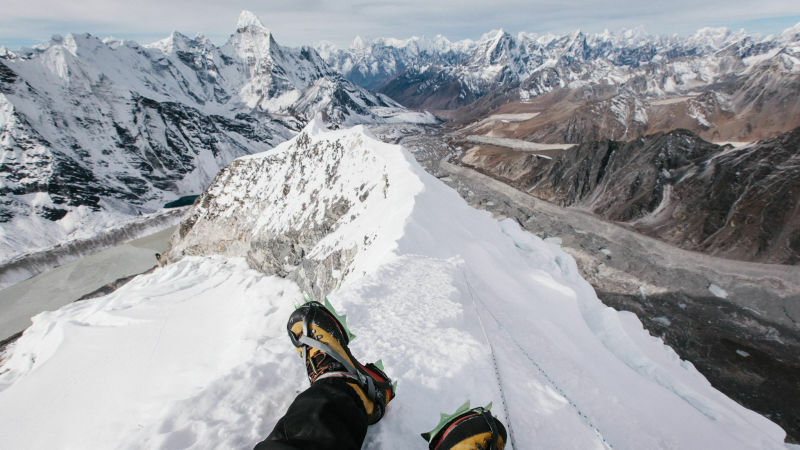 As part of our acclimatization programmer we visit Everest Base Camp and make an ascent of the classic viewpoint of Kala Pattar, where we enjoy some of the finest views of the world’s highest peak. Then crossing the Khumbu Glacier, we climb up to the Kongma La which gives access to the valley of the Imja Khola and the summer grazing settlement of Chhukung. 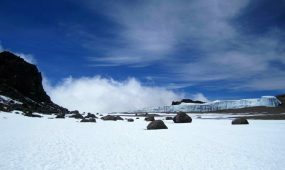 From here we move up to the base camp for our main objective, Island Peak. 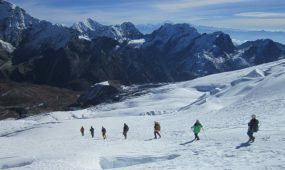 The ascent of this 6000 metre peak in the shadow of the huge Lhotse face is an ‘alpine experience’ in every sense, involving fine climbing in exposed situations among breathtaking scenery. This is one of the best of all Nepalese adventures.